Pollen is the fertilizing dust of flowers. Bees gather and bring it back to their hives for food. Without pollen, plants, trees and flowers could not exist; even we depend on it. Forever Bee Pollen® is gathered in specially-designed stainless steel collectors from the blossoms that blanket remote, high desert regions. This ensures the freshest and most potent natural food. 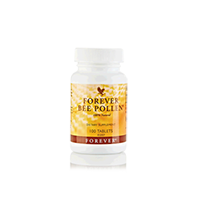 Forever Bee Pollen is all-natural and contains no preservatives, artificial flavors, or colors. Bee Pollen is readily digestible and easily absorbed by the human body. Research by scientists suggest that Bee Pollen provides energy and may enhance stamina.